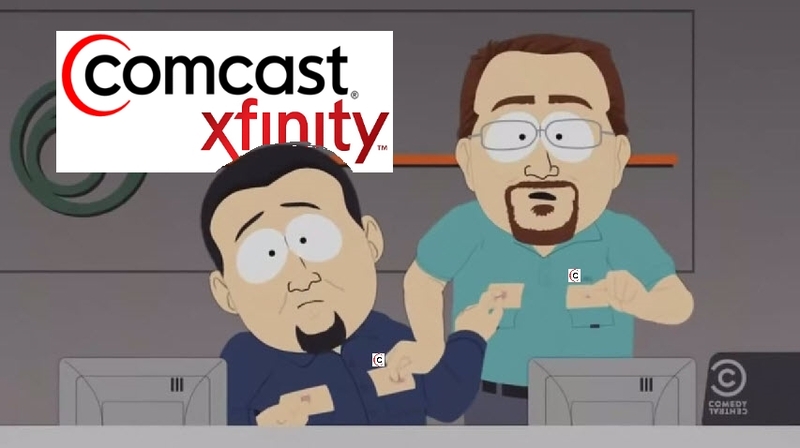 Comcast’s comcastic consumer extortion tactics! This is purely a rant post because I hate Comcast with every part of my being. Louie CK said it the best, summarizing: “I am using my whole body to hate them.” I thought I hated AT&T the most, but in comparison Comcast and the crap they are pulling with their customers it is absolutely reprehensible. If you haven’t seen this clip already then I would say watch it for a good laugh, South Park gets it right everytime. Where is the hate coming from? As some of us are aware Comcast is trying out a program that they are trying to pass off as some sort of beneficial feature? Who the hell is this benefitting? It sure isn’t me. Program features explained with Comcastic sarcasm! You are exempt of the data cap for the 3 first months! Woo hoo! Oh boy I can’t wait to pay more for the exact same thing I had already! If you surpass the 300GB cap, then don’t worry you just have to pay an additional $10 for each 50GB that you use over your 300GB cap. No big deal! Right?! Don’t want a data cap on the service you have probably had for a very long time already? No problem! You can pay a Comcastic extortion fee of $30 additional on top of whatever you pay already! Isn’t that great? It’s like they are doing you a favor, great guys over there on the C-Level of Comcast. I don’t download tons of files from questionable sources like other people I know. I stopped doing that a long time ago. So what the hell is eating up my bandwidth? I use my home PC for working, which I use with the Citrix Receiver so I can work remotely. When I am relaxing I will watch Hulu, Amazon Prime Video or Netflix because I can watch what I want when I want without commercials. This apparently eats up a lot of bandwidth per hour. Lastly I am rightly calling Comcast a Monopoly because in my area Comcast is the only *gag* reliable vendor. In Florida the AT&T (formerly BellSouth) copper phone lines are absolutely shot and totally unreliable and who the hell wants to use DSL? That’s right, nobody. I will credit Comcast with decent speeds and service that is about 90% uninterrupted. There is a possibility of jumping on AT&T’s U-Verse but it is very difficult to obtain and it uses those same cruddy lines I was talking about before. Therefore – I GOT NO WHERE ELSE TO GOOOO!!! The only way to realistically fix this problem is for the government to step in and tell Comcast they have to stop what they are doing right now. Unfortunately that could take a while, but don’t wait around, do something about it yourself. You need to submit a complaint with the FCC and the Better Business Bureau if you got burned on a bill which Comcast is famous for doing. Everytime I feel like I have gotten the short end of the stick, I look for ways to make the offending party’s life a littler harder too. I don’t care if it is petty and I don’t care if it isn’t very significant, as long as I know that I made a small impact I am a happy guy. 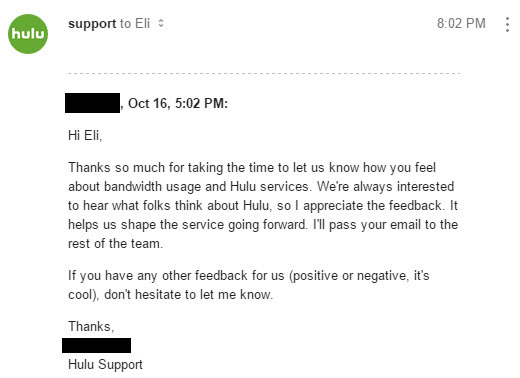 I contacted Netflix and Hulu to give them an idea that they could use to reduce bandwidth which will help everyone out if this applies to you. Some people like to just have background noise like my wife. My wife listens to HGTV she doesn’t actually watch it like 80% of the time. Well since she is just listening to it then why not provide an option to just disable video? That will certainly reduce the 2.3GB per hour figure down to a manageable 50MB per hour or less and I am sure the development for this wouldn’t be a big deal. Add a new checkbox that simply says “Disable video stream” and stop streaming video so you can just listen to your shows or that movie that you have watched like a million times already. I hate Comcast so hard right now. They hate their customers and we hate them back. The only reason some of us put up with them is because we don’t have a choice, we have to use them as our internet utility. I have always said that if I was going to start a gang I would name my gang Comcast because I would instantly obtain street cred because of the affiliation alone. To close out this rant, here is one last video about cable companies because it hits every nail on the head for what we are all thinking.